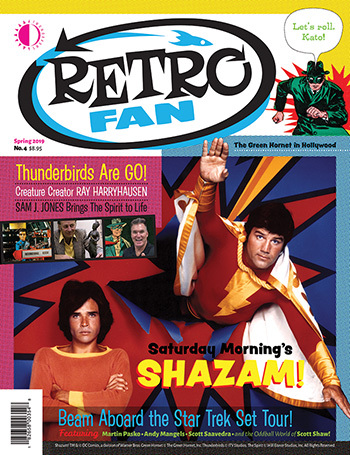 Just in time for the big screen rendition, RetroFan #4 spotlights Andy Mangels’ exploration of the Saturday morning live-action Shazam! TV show, featuring interviews with John (Captain Marvel) Davey and Michael (Billy Batson) Gray. Martin Pasko’s Pesky Perspective sets its sting on the Green Hornet in Hollywood! Ernest Farino remembers the magical monster maker Ray Harryhausen! The Oddball World of Scott Shaw time-travels to the long-gone, way-out Santa Monica Pacific Ocean Amusement Park! Plus: the Star Trek Set Tour, interviews with actor Sam J. Jones and Jan and Dean’s Dean Torrence, the British sci-fi TV classic Thunderbirds, Super Collector’s virtual museum of Harvey (Casper, Richie Rich) merchandise, the wild and crazy King Tut fad, and more fun, fab features! Edited by Back Issue magazine’s Michael Eury. This entry was posted in TNT on 26 March 2019 by Mr. Morrow.